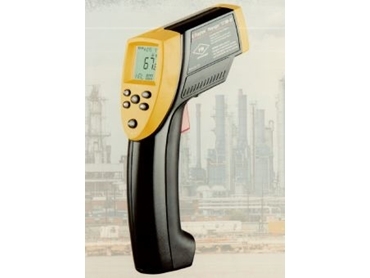 A PORTABLE non-contact infrared thermometer for use in potentially explosive or flammable environments has been introduced by Raytek Corporation. The new ST80-IS makes the speed and convenience of non-contact temperature measurement available to hazardous location users. Its long-range optical resolution of 50:1 allows measurement of small targets at long distances. This capability increases safety in situations that might otherwise require climbing or reaching into dangerous areas. Response time of 500ms assures accurate readings when target temperature is changing rapidly and improved response when using the instrument to sweep wide target regions. One percent accuracy meets the requirements of critical monitoring applications. Circular laser sighting allows more intuitive estimation of target size at a distance: users can highlight target areas for fast, safe readouts. Acquired data from up to 12 locations can be logged within the unit for later download to computer. Standard features of the company's Raynger non-contact thermometers, including backlit display, low battery indicator, automatic shutoff, adjustable emissivity and audible/visible alarms for high and low temperatures, are included in the intrinsically safe model. An intrinsically safe RTD (resistance temperature device) probe for contact measurement is also included. This allows for measurement of sub-surface temperatures and adjustment of the unit's emissivity. The handheld unit has a rugged, rubberised grip and protective moulding on nose and back for shock resistance. It can also be tripod-mounted for hands-free operation. ECE Fast 03 9538 8111.